I just found this short video that reminded me of how simple our lives would be and how much healthier our dogs would be with the use of a dog crate, a simple dog crate. If this happens at your house during meals or at holiday time it may be time for a change. This video is funny however this, in real life, can he hazardous for your dog and other pets. We should all take time to be attentive to our pets and their safety during this season. Dog health is not always at the front of our minds until an accident occurs. Actually, if we can learn a few dog safety tips that benefit all our pets we can keep them safe all their lives. You can prevent dog problems in your home. Love your pets and take care of them. They deserve it! 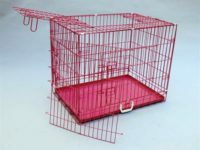 For the highest quality dog crates, pet carriers, pet strollers and much more at discounted pricing please do feel free to visit us. Special pricing for purchase of multiple items too.